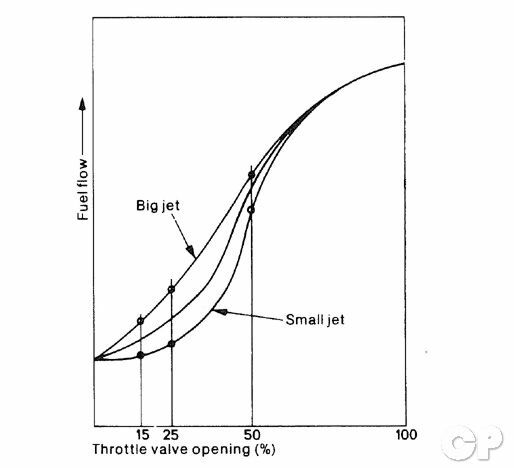 This illustration shows the effects of the various carburetor jet systems in relation to the throttle valve opening. The thickness of the arrows shows when the different jets come into play. The carburetor is provided with a starting device. To get a richer air/fuel mixture to be sucked into the engine, press the choke button down and close the throttle. 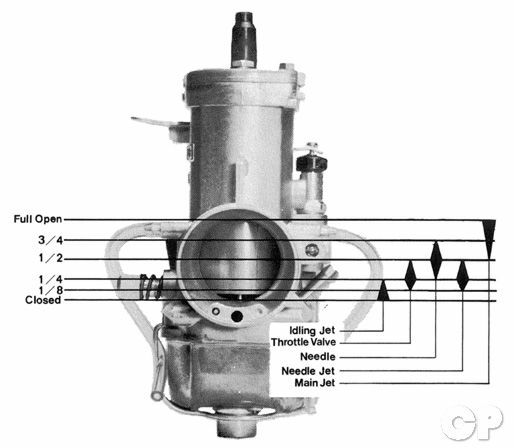 It is important to avoid confusion when confronted with the terms “jet needle” and “needle jet.” The jet needle is the actual needle that descends into the carburetor from the carburetor slide. The needle jet is the orifice the needle fits into. The needle jet and the needle serve to control a proper air-fuel mixture ratio during the so-called medium throttle valve opening (between 1/4 and 3/4 opening). The needles usually have 3 to 5 clip settings, the uppermost giving the leanest and the lowest the richest mixture. As you see on fig. the needle setting is mostly noticeable at 50% throttle opening. By changing the needle jet you can get a richer or leaner air-fuel mixture. A small needle jet will give you a leaner mixture and a bigger needle jet gives you a richer air-fuel mixture. 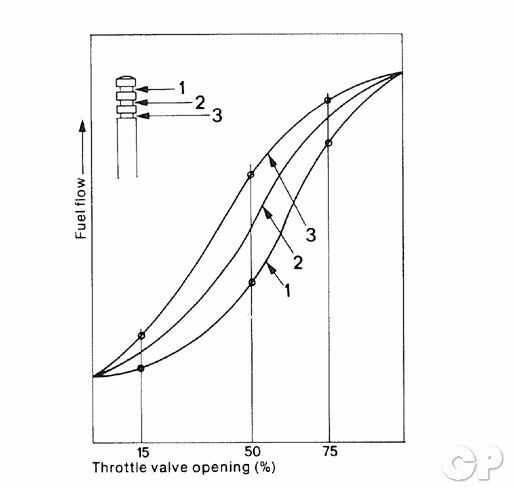 The figure shows the throttle valve opening in relation to fuel flow, with different kinds of main jets. 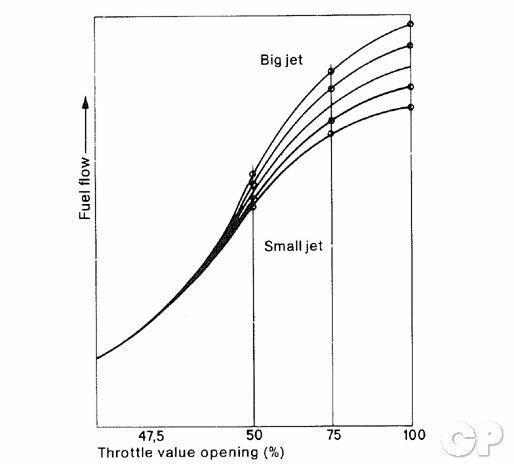 The main jet has the most effect within the 50-100% throttle opening range. High temperature, high elevation above sea level and lower barometric pressure generally require leaner settings. However, remember to restore the richer setting when conditions are normal again. If settings are too lean, acceleration and top speed will be less and there will be risk of engine damage. 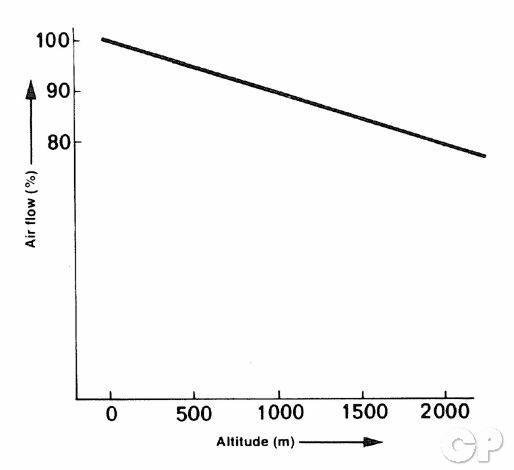 The figure shows the amount of air decreases in proportion to a rise in elevation. Reduction in the amount of air sucked into the cylinder changes the air-fuel mixture ratio, with the result that the power output drops markedly. When the carburetor setting is not correct for the engine, various irregularities are noticed. These can be traced to two main reasons. (a) The engine noise is dull and intermittent. (b) The condition grows worse, when the starter is opened. (c) The condition grows worse, when the engine gets hot. (d) Removal of the air cleaner will improve the condition somewhat. (e) Exhaust gases are heavy. (f) Spark plug is fouled. (a) The engine gets overheated. (b) The condition improves when the starter is opened. (e) The revolution of the engine fluctuates and lack of power is noticeable. 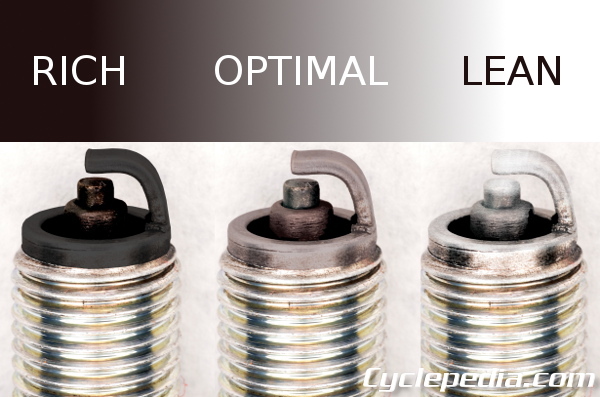 The color of the spark plug’s porcelain tip can indicate how the mixture is burning. A white colored plug shows a lean mixture, where a dark plug shows a rich mixture. A light brown color is optimal. Inspect the plug for running condition after jetting changes and evaluating the engine performance by ear and feel. See the Spark Plug Chart for additional information on spark plug condition troubleshooting. If significant jetting changes are required check for problems like air leaks, dirty air filter, carburetor float level, dirty carburetor, spark plug condition, old fuel, and weak compression. Performance modifications may also require more jetting changes than a stock unit. I have a two stroke yz 85 and i was wondering if i move the clip down would it make it leaner? Moving the clip down will raise the needle which will richen the mixture.